This was an historic presence in downtown Sarasota, along the Tamiami Trail (or less fondly, US 41/301). Originally designed in elegant Spanish style, El Vernona Hotel was completed in 1926. In 1930 the resort hotel was purchased by circus magnate John Ringling, of the Ringling Brothers, Barnum, and Bailey Circus. He re-named it The John Ringling Hotel, featured circus performances in-house, and opulence was the rule. 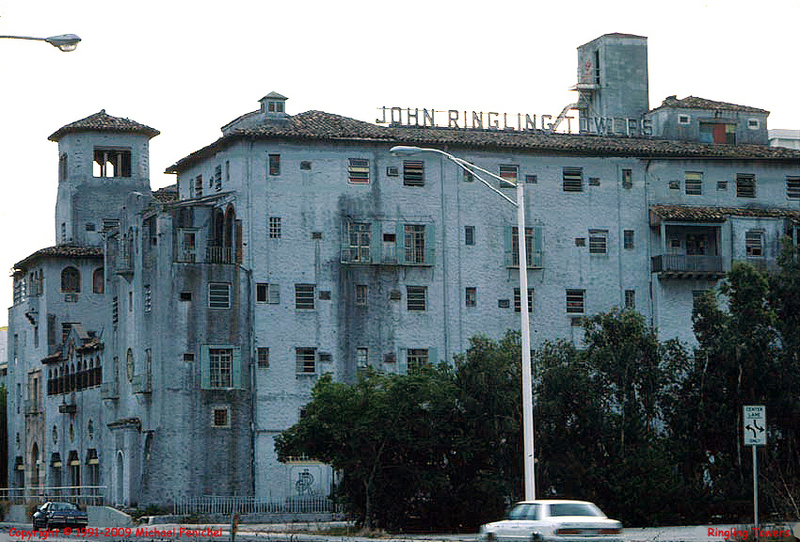 By the 1960's it was a condo palace hotel resort named the John Ringling Towers. The location was perfect: just off the Tamiami Trail along the most beautiful beaches anywhere. Tamiami = the TAmpa to MIAMI trail. Perfect for the resort and traveling big spenders. That was in the heyday, in different times. I took this photograph in 1991 and already one could see that recent years had not been kind to this tropical monument. Nearby, however, the Ringling Mansion and Museum is still quite a treasure. And the surrounding area is now a thriving arts center with outdoor art as well as culture and nature ... Shh, it's a secret place! Here's what this bit of history looked like in 1991. For the record.